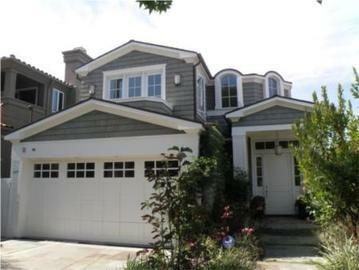 Cape Cod in Manhattan Beach! Living Area 4,658 Sq. ft. Lot Size: 5,760 Square Ft.
Expect the finest of finishes and the most luxurious of amenities in this custom 6 bedroom & 6 bath home in the presitigious Manhattan Beach Hill Section. The spacious tri-level floor-plan of approx. 4,658 sq. ft. boasts a Media Room, a Family Room with fireplace, Play Room, a Gourmet Kitchen with Thermador, Sub-Zero & Bosch appliances, and Luxurious Master Suite with fireplace. Other features include a spacious deck with outdoor fireplace, a beautifully landscaped backyard, and Elevator - just to name a few . . .